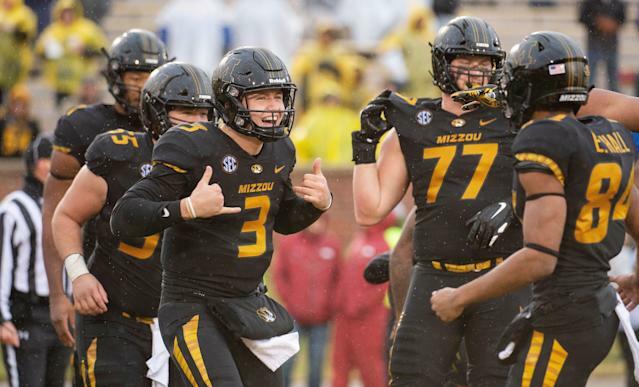 When it circulated around the NFL early this week that Missouri quarterback Drew Lock would be a late visit added to the docket of the Green Bay Packers, an NFC personnel man who worked on a staff with Packers coach Matt LaFleur was nonplussed. He completed the thought with the only question that matters when a visit like this pops up. Could Drew Lock or Daniel Jones give Packers golden opportunity? Lock visiting the Packers this week – and the team also attempting to schedule a visit with Duke’s Daniel Jones – illustrates the last-minute visits that occasionally insert unexpected question marks into the draft. Is there some indication a highly rated player is sliding? Is this some ruse, hoping to manipulate a draft day trade? Or is this a franchise thinking outside the box and applying the concept of long-term preparation over short-term need? 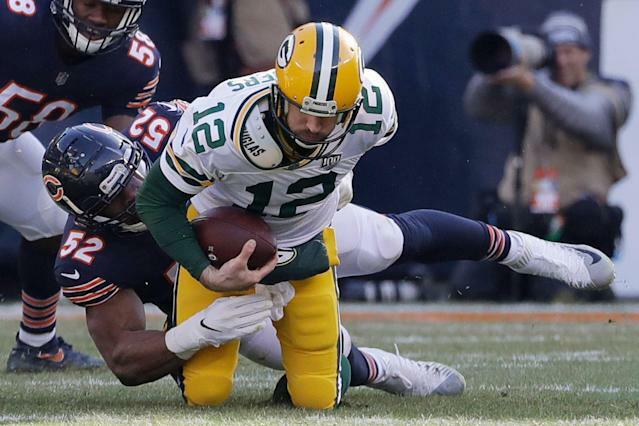 With the Packers and the quarterback spot, it could be any of those scenarios. They could be trying to instigate a trade that pushes another player down to their 12th or 30th picks in the first round. Or they could be doing some due diligence on quarterbacks, knowing Lock or Jones could falter at the NFL level and become available down the line, like current Green Bay backup DeShone Kizer did in Cleveland. Or, well, the Packers may actually be thinking years ahead of everyone else, and making plans to secure another decade of stability at the quarterback position. Taking the sustained brilliance of the Brett Favre to Aaron Rodgers transition and extending it to what few NFL franchises could fathom: another transition down the line that could lead to an unprecedented 40-year run with a high level quarterback at the helm. Before Packers fans lose their minds about the team burning one of two first-round picks on a quarterback, they should take a moment to absorb the opportunity at hand. It’s not often that a successful franchise has two first-round picks at its disposal. And it’s even more rare that maybe the right quarterback will be available for a long-term grooming plan. Yet, that could be precisely what the Packers are staring at right now. More important, a rare opportunity that isn’t foreign to the franchise. Few in Green Bay need to be reminded of this scenario. Either they’re old enough to remember that day when Rodgers was drafted with a 2005 first-round pick – when a 35-year-old Favre was on the roster – or they’ve heard the tale retold one of the 50 million times since it happened. Internally, there’s no question of that memory. Current general manager Brian Gutekunst lived through it as a Packers scout. Current team president Mark Murphy was front and center for the turbulent Favre-to-Rodgers transition in 2008. Like Gutekunst, he knows what this road looks like, down to every last curve and pothole. It’s why this scenario is intriguing. There is enough institutional knowledge – and plenty of proven benefits – to suggest that the Packers’ brain trust could seriously consider taking a quarterback with one of the first-round picks in hand. Is it likely? No. But chew on this one: It was actually less likely that Green Bay would take Rodgers when the 2005 draft started, given that the franchise had only one first-round pick and Rodgers was likely to have been long gone by the time the Packers had a shot at him. Now? Not only could one or both of the Lock/Jones tandem be on the board at the 12th and 30th picks, but Green Bay has the additional first-round capital to roll the dice, while also having addressed other pressing needs this offseason. This is what a splurge in free agency (for Green Bay, anyway) can buy: some draft flexibility that even includes an opportunity to look at quarterbacks. The Packers’ additions of linebackers Za’Darius Smith and Preston Smith, safety Adrian Amos and guard Billy Turner puts Green Bay into a spot where it has a luxury option with its two first-round picks. While 12th overall pick can be targeted for more immediate starting help – think tight end, offensive tackle, edge rusher and linebacker – the 30th choice acquired from the New Orleans Saints last year can be the “window” pick. One that has a contingency plan where if the right quarterback falls, they can take him, squirrel him away for development and don’t regret it. That’s something fans have to understand about transitioning from one starting quarterback to another who is being developed. It’s a chess game. There is complexity. It takes plenty of mental energy. But when a team is truly good at it, it has something special that sets it apart from opponents. And nothing sets any NFL franchise apart than the ability to transition from one great quarterback to the next without dead years in between. The Joe Montana to Steve Young window kept the San Francisco 49ers competitive for 18 years. The Drew Brees to Philip Rivers handoff has kept the San Diego/Los Angeles Chargers competitive for 17 years and counting. But none has been as impressive as Favre to Rodgers, which has helped keep the Packers in the league’s mix of relevancy since 1992. That’s an insane 27 years and counting. The span includes 19 playoff seasons, three Super Bowl appearances and two Super Bowl wins. Maybe you can argue there should have been more championships in that run, but you can’t deny that for nearly three decades, the Packers placed themselves into an elite tier alongside celebrated franchises like the New England Patriots and Pittsburgh Steelers. And they did it largely by solving the game’s hardest position with two Hall of Fame caliber quarterbacks, not to mention the foresight and guts to transition from one guy to the next, despite the significant friction and second-guessing that initially comes with such a move. So here’s the key question for Green Bay: With two first-round picks, what if it sees a quarterback on the board who can help take that 27-year window of success to 40 years? And what if that player falls in the draft like Rodgers did in 2005? Say Gutekunst, Murphy and LaFleur see their next Rodgers in Lock or Jones. Now imagine Lock or Jones sitting there at 30. Some will argue Rodgers is going to play for another four or five years, so that pick can’t be made. Packers history suggests the real malfeasance is knowing it’s the right quarterback pick – and an act of preparation that has worked – and then not making the selection. Teams get themselves in trouble when they draft for a need rather than a plan. The Patriots have spent two decades drafting more for a plan than a need. And by doing so, they’ve swapped out key parts around Tom Brady and kept rolling. In the rare instances they have reached for a need (see their history of wide receiver selections) they have had some significant disappointments. So what is the chess move here for Green Bay? Well, that all depends on how the team feels about a guy like Lock or Jones, or perhaps another quarterback who isn’t obvious. If the Packers don’t like any of them, the maneuver is to tip that they’re looking at quarterbacks. It could be why they brought in Lock and Jones late in the process, sending messages to teams below the 12th and 30th overall picks that, hey, Green Bay might take their guy. And maybe they instigate movement where a franchise jumps up in front of them and pushes another player on the board down. Teams absolutely do this. And if you think they don’t, I’ll share this: In the past month, I’ve had a draft analyst on the TV side tell me that some of his NFL friends in front offices have half-jokingly asked him to talk up specific players as hot commodities on draft boards, in hopes that it would stimulate those guys to come off the board and push someone else down. So don’t put it past a team like the Packers to burn some personal visits with guys like Lock or Jones to send a signal and hope it generates some draft day movement that benefits Green Bay. That’s the kind of pump fake that happens this time of year. And if that’s what the Packers are trying to do, then the mission is accomplished. The visits have been aired out. As a matter of public record, Lock and Jones are supposedly on Green Bay’s radar. But if the chess move is the obvious one – actually considering Lock or Jones – then the difficult part is just getting here. First, waiting to see if one of the preferred guys is on the board where it makes sense for the Packers to take him, which would seem to to be the 30th overall pick. Second, having the constitution to make the pick, which would undoubtedly put a little needle into the side of Rodgers. And finally, navigating the fan conversation that comes next in the Green Bay bubble: What does this mean about Rodgers? What was Aaron’s reaction? What’s the long-term plan? How will this next quarterback be groomed? and at some point, how hard is Favre laughing right now? Make no mistake, all of this can happen when this draft comes and goes. Kizer showed enough in 2018 to suggest he’s not any kind of long-term answer to replace Rodgers, and isn’t a great answer in the short term if Rodgers is sidelined by injury. The hard data on Rodgers, who has a monster contract, shows a recent history of injuries for a player entering the backside of his NFL career. Rodgers isn’t a great candidate to play into his early 40s. Would he like to do that? Surely. Most competitive quarterbacks will feel that way. But just because Rodgers states that as an intention doesn’t mean his body or skills will hold up as long as he expects. I’m sure guys like Ben Roethlisberger, Eli Manning and Rivers have days when they can see playing beyond 40 at an elite level. But it’s asinine to think it’s something that can be wished into existence. Even for players like Rodgers or Brady. The Packers are sure taking all of this into account. Fans should do the same and ask themselves, are they sure that an insurance policy like Lock or Jones isn’t the smart move here? If either of those players is seen as a true successor with a 10-year career after Rodgers departs, then it’s not only a good option, it’s a must. Fans can feel free to debate that, but I’ll just end all of this with the brass tacks numbers, which should be considered alongside the idea of pivoting into the next iteration of quarterback stability. Rodgers turns 36 in December. He’s had some troubling injuries for two straight seasons. Under his current contract, he’s essentially locked in as the team’s starter for the next three seasons. That’s not changing, barring catastrophic injury. All of which takes the Packers into 2022, the season when a 38-year-old Rodgers will have a whopping $37 million salary-cap charge. Even with the latest Russell Wilson contract extension, a $37 million cap charge is the kind of money that suggests Rodgers should still be playing like a top-five quarterback in the NFL. With that in mind, play the current scenario out. Say the Packers feel Lock or Jones or some other quarterback is absolutely going to develop into a star at the position. And say the Packers have an opportunity to get one of those guys near the 30th overall pick. If they select that player and then groom him for the next three years, the team has undeniable flexibility in 2022, either to begin a transition or potentially flip that quarterback for new draft capital. If Rodgers isn’t living up to his cap charge in 2022, the Packers will be able to part ways with him and take only an $11.5 million hit in dead cap money. That should be very easy to deal with in 2022, not to mention also opening up a net salary cap gain of $25.5 million to be used elsewhere. 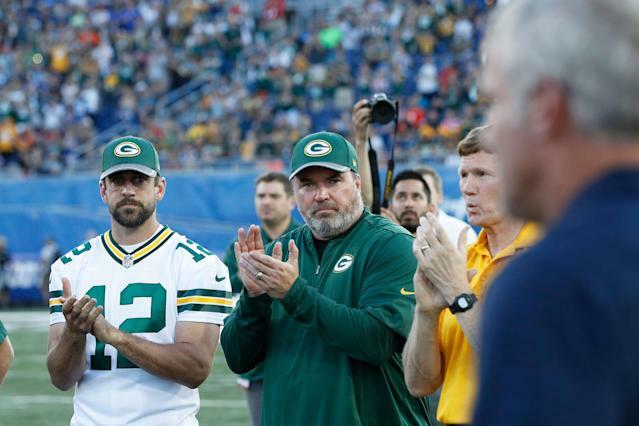 Simply put, Rodgers can be moved off the roster in some fashion and the quarterback the Packers have been grooming can step in and start in his fourth NFL season – mirroring what happened when the Packers went from Favre to Rodgers in 2008. There’s a beneficial flip side, too. Say Rodgers enters 2022 sustaining a high level of play like Brady. That would give the Packers the option of taking the quarterback they’d groomed for three seasons – and who hopefully would have shown his tools in whatever opportunities he had during that span – and put him on the trade market before his fourth year. Something along the lines of what the Patriots did with Jimmy Garoppolo. If that was the option on the table, it would mean Green Bay got the best of all worlds: Rodgers continuing to justify his salary slot; the young quarterback providing high level insurance as a backup; and the ability to get trade capital at the end of the rainbow. Everyone wins in that scenario, albeit with some dynamic tension that’s bound to exist between Rodgers and his presumed backup. This is what can happen when a franchise drafts for a plan rather than a need. It’s a long play, with some assumed risks, but that’s what the best franchises do. In some circumstances, they’re willing to look three or five or seven moves ahead of the field. Sometimes that’s what it takes to be special for decades, rather than years. The Packers should know this. They have done this. And now might be the time to do it again.